It is an imperfect, but accepted, part of democracy that after an election, the winner rewards his or her supporters with positions in the top team, or in the Party machine. This happens in the United Kingdom in a relatively muted way, particularly in government, thanks to our non-political civil service. In Washington, a new administration brings a total clear-out, going quite far down into government. When David Cameron won the leadership of the Conservative Party in December 2005, he was careful to ensure key supporters were given a role, but that the front bench properly reflected all strands within the Party. After all, his closest rivals were given very important roles: David Davis was Shadow Home Secretary, Liam Fox Shadow Defence Secretary, and so on. As it happens, neither Davis and Fox is in that position today, but in neither case has David Cameron actively removed them. The Labour leadership contest in 2010, and developments since, have been very different. We all know that David Miliband has refused to serve under his brother, and we should take at his word Ed’s assurance that a place is available for his older brother, should he want it. However, readers might not be aware that many other supporters of David Miliband, many of whom are talented and willing MPs, have not been offered places on the Labour front bench. Worse still, in little-noticed mini Labour reshuffles since then, many have been eased out. Who voted for whom in 2010 can be seen here and who serves on Labour’s front bench is here. Some commentators appear to be suggesting that the UK should not play a full role in the International Monetary Fund, or in increasing its capital base, or that somehow the IMF is part of a larger plot to drive forward European federalism. I used to work from time to time with the IMF in the 1990s, when I worked in debt finance markets in London and particularly in New York City. At the time, the IMF was heavily involved with sovereign borrowers like Argentina and Bulgaria which were experiencing financial difficulties of one sort or another. And this makes the point: the IMF is there as an important resource to help countries across the world which may be in short term or longer term financial difficulties - not just those in the Eurozone. Indeed, the UK itself, as we know, with Labour’s previous disastrous record running our public finances, had to have recourse to the IMF in the 1970s. It would be strongly against our national interests to not participate in the IMF. Britain would lose a considerable amount of influence, and we would lose a significant part of our recently hard-won reputation as a beacon for financial good management since the Coalition Government took over in May 2010. The Chancellor strongly rejects any suggestion that we should not be part of the IMF. Recent moves to increase the IMF’s resources were first agreed by the G20 in April 2009. This was crucially well before any Eurozone support packages. Earlier today, my colleague Steve Baker posted that MPs were to be given favorable tax treatment due to a mysterious clause in this year's Finance Bill, published just after the Budget. Thinking this a little odd, I checked with the Treasury earlier. The new rules arise as a result of IPSA and what is called disguised remuneration. In short, the disguised remuneration legislation is designed to stop remuneration being diverted through a third party and disguised in a form to avoid tax. For example, loans are used which are subsequently written off and the full tax revenue is not collected. In order to ensure that the anti-avoidance arrangements are as effective as possible, the legislation is broadly drafted with a number of carve outs. These include a carve out for deferred bonuses in accordance with the FSA requirements in this area, group company transactions and other genuine commercial transactions and a specific carve out for employee car ownership schemes. The United Kingdom prides itself on respecting its diverse cultures and ethnicities. Such a sentiment does not much resonate in the People's Republic of China, whose authoritarian communist rulers are obsessed with unity and mistrustful of diversity. To Beijing, manifestations of cultural identity by China's many ethnic minorities are barely tolerated and only if they do not promote separatism or secession. China’s astonishing meteoric rise to become the world’s second largest economy, with a global political and military outreach, has sadly not been matched with a concomitant rise in its respect for the fundamental human rights of its people or an increase in democratic accountability of its leadership. Much is written and known about China’s suppression of Tibetan culture or autonomy, its persecution of Falun Gong practitioners and unregistered Christian churches and even its censorship of the internet, but less is known about the planned destruction of an ancient and distinct cultural patrimony in its far western provinces. It is probably this suspicion of non-Han Chinese cultures that has led the Chinese government to engage in an act of cultural vandalism - the wholesale demolition and rebuilding of the ancient city of Kashgar. This programme of destruction was recently the subject of a resolution in the European Parliament, which roundly condemned Beijing's action. Charles Tannock is an MEP for London and vice-chairman of European Friends of Israel; Greg Hands is MP for Chelsea and Fulham. The political turbulence in Egypt worries us all, but no-one is more concerned than Israel. The Middle East's lone democracy is afraid that its 32-year peace treaty with Egypt is at risk of unravelling. War would be a strong possibility if the Islamist Muslim Brotherhood seized power in Cairo. In any case, Israel will have to draw military resources towards the Sinai, thus reducing its forces on the northern front and thereby encouraging the fanatics of Hizbullah in Lebanon. Israel needs friends, and never more so than now. It was therefore heartening for us last weekend to be part of the second policy conference of the European Friends of Israel (EFI) and to see so many influential policymakers gathering together to express their solidarity with the Jewish state. The conference brought together over 300 parliamentarians and a distinguished list of five former prime ministers and presidents (including Jose Maria Aznar of Spain and Alexander Kwasniewski of Poland). EFI is an organisation established along the lines of Conservative Friends of Israel (CFI), which is renowned in our party for its influence and strength. Although EFI is non-partisan it is true that more of its members come from the right than the left of the political spectrum. EFI, which was set up in 2007, has the motto 'democracy, peace, dialogue': democracy, because it is important to emphasise the fundamental values that Israel and the EU share; peace, because EFI supports Israel's own overriding goal of making peace with its neighbours; and dialogue, because EFI not only encourages dialogue between Israel and the Palestinians but it promotes dialogue between like-minded parliamentarians. Greg Hands is MP for Hammersmith and Fulham and a shadow Treasury minister. Here he gives a very personal reflection on the events leading to the fall of the Berlin Wall twenty years ago today. When ConservativeHome asked me to write a piece on the 20th anniversary of the day the Berlin Wall was opened, I decided on two things. First, especially given the number of reminiscing articles in recent days from leaders and politicians from the time who were necessarily looking at the issue from above, that my piece would view things from the bottom. It will also be personal, however. All of the photos here are taken with my camera. Second, so much attention has been given to how the Wall was opened on this day, that we are in danger of overlooking what happened in the preceding 40 years of East German communism. In other words, the fall of the Wall has become too much an event in itself, and not enough the demise of a four-decade long system. Between March 23rd 1985 and its abolition on 3rd October 1990, I visited the GDR (East Germany) 48 times. I also lived in Prague for a summer, but for much of those five years, I lived in West Berlin, which was a remarkable place for reasons many readers will be familiar with. Perhaps its most striking feature was the ability of a visitor to cross from our free market, democratic system, to a Communist dictatorship within the short space of about 20 minutes, by walking perhaps 20 metres across a border, in a way which in 2009 is simply not possible. The Korean Demarcation Line probably comes closest, but there it is only a very selected few who can cross. In those years, I did work from time to time for the West Berlin based “Arbeitsgemeinschaft 13. August” and the Frankfurt-based, “International Society for Human Rights”. My role was to meet dissidents, generally people who had no international recognition, often very ordinary people. Like Heiko in East Berlin, who was a cook, with a Berlin accent so strong as to be almost incomprehensible, who had spent time in the notorious East German jail in Bautzen, and remained defiant faced with Stasi-sponsored break-ins to his flat on almost a weekly basis. His crime? Making a legal application to leave the country. Greg Hands, MP for Hammersmith and Fulham, recounts how the Government kept dragging its feet on the immigration status of a constituent of his with a background in terrorism, but wasted no time in sorting out the status of Watford Player Al Bangura. As we know, the Conservative Party has at present precious few inner city MPs, yet I believe that our numbers are set to expand dramatically when the next election comes. One of the more trying aspects of the role that will face these new MPs is immigration casework. They will quickly be introduced to the chaos of the UK’s immigration system, which, regardless of one’s own views on the merits or demerits of immigration, does nobody any favours, due to its astonishing inefficiencies and institutional incompetence. The Home Office is pretty much incapable of counting anything, it seems, not least the number of people coming in and out of the country, absconded foreign prisoners and so on. It does, however, produce a “League Table” of which MPs come to it with the most immigration casework. As MP for Hammersmith & Fulham, I am in the top ten, and ranked highest among Conservative MPs. Incredibly, I have at present between 700 and 800 unresolved immigration cases – that’s out of a total constituency of just over 80,000 electors. This is around 35% of my casework. Meanwhile, one of the pieces of evidence often cited to show that the Conservatives have so few inner city MPs is the fact that until recently, no Conservative MP represented a Premiership football club. This changed at the last election, as I actually represent two of them, both Fulham and Chelsea. Another thing one quickly learns in the Commons is that Labour MPs need to show a commitment to the beautiful game – for some it is genuine, but for others it is false, even an affectation. I will come back to Labour’s obsession with football in due course. My colleague Gerald Howarth once said that if anyone accused him of being “moderate”, he would sue. Nevertheless the term “moderate” does not usually invite opprobrium. In Sweden, however, our sister party, the Moderate Party clearly came to believe that the term had been “contaminated” and decided to rename themselves the “New Moderate” Party. They are now in government, leading a 4-party coalition under Prime Minister Fredrik Reinfeldt, who ConservativeHome readers will recall addressed our Party Conference in 2006, shortly after he assumed office. The Moderate Party have some exciting policies. From a British perspective, they are very free market, but also rather more libertarian than our Party. Most interesting of all for us, they have carried out a number of important and successful experiments in education policy, including a successful schools voucher scheme, which I will return to. There are many good things about their Conference. It is young, the average age being around 40 – and there are many young women MPs, some in high positions, like the Minister for Overseas Development and the Chairwoman of the Europe Committee. Whatever one thinks about the “A List”, nobody can deny that we in the Conservative Party have a problem in not having enough women under 60, let alone 40. 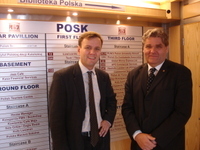 Greg Hands MP reports from yesterday’s Polish election….in Hammersmith! I have just returned from a couple of hours at a polling station for today’s Polish elections at the Polish Cultural Centre (or POSK) in Hammersmith (I'm pictured with its Chairman, Dr Olgierd Lalko). The Poles at the polls – if you excuse the pun – are rather an amazing sight. The queue at around 3pm was two hours long, despite polls having been open since 6am. A carnival atmosphere was starting to take hold, with plenty of media interest from Poland and from the UK, with BBC London and News24 each sending teams. A walk through Ravenscourt Park would make you think you were in Lazienki in Warsaw! Today’s Polish election is quite important for Britain and for the Conservative Party. The Poles are key partners for us in Europe, and represent one of a group of Central and Eastern European countries that warm to our vision of a grouping of sovereign nation states freely trading and co-operating with each other. There may even be future partners for us in our new MER Group in the European Parliament. Greg Hands is MP for Hammersmith and Fulham. Last month, our armed forces reached two unlikely milestones. On 12th June, after 2,074 days, the war in Afghanistan overtook World War Two in length. On 27th June, after 1,560 days, the war in Iraq overtook World War One in length. Only seven years into the new century, the only two conflicts for our forces have overtaken the two longest wars of the entire last century, itself possibly the bloodiest ever. I write this not because these conflicts are in any way similar, but to give some kind of historical perspective on just how long these military operations have been. We can be thankful that the casualty rates have been in no way comparable. Every Wednesday at noon, when the Prime Minister reads out the names of the fallen over the previous week, I am in the Commons Chamber and I am sure I am not alone in feeling anguish at the deaths of young men in foreign fields, far away from the UK. If the same practice had prevailed in the House of Commons during World War One, however, the 19,240 dead on the first day of the Battle of the Somme would have taken the Prime Minister until around 9pm on Thursday night to read out. The casualty rates and the domestic impact of the wars could not be much more different, but the time span alone should lead us to ask when it will all end. Greg Hands, MP for Hammersmith and Fulham, worries about the power of Russia's intelligence apparatus. Sitting in the Seven Stars pub on North End Road in Fulham, Alexei looked up from his beer, and asked me if I could get him a document from the House of Commons library, a statement made by the then Foreign Secretary Jack Straw on UK relations with Iran. It was then that it dawned on me that I was being approached by an intelligence officer to spy for Russia. It all started in December 2004, when the Conservative donor club Fastrack held its Christmas Party at the Russian Embassy in Kensington. Boris Johnson was the guest speaker, and it was hosted by the then Russian Ambassador to London. It was the kind of event that many ConservativeHome readers have been to over the years. At the event, an official from the Embassy sidled up to me and my wife, introduced himself as being Alexei (whose name I have changed) from the embassy’s political section, and how he lived in Fulham, in the constituency I had been selected to fight at the coming General Election, which was widely expected in the following Spring. The official and I, in the convivial atmosphere of the reception, talked for a short time and swapped business cards. I have had a 20 year long interest in Russia, and have been a frequent visitor, and my wife is half-Russian, so conversation came very easily. I asked him if he was happy for me to add him to my list of constituents’ email addresses, and he was. On Wednesday (28th March), the House of Commons will debate the latest in a series of measures that will skew individual constituencies in the next General Election in favour of the incumbents. MPs will decide whether to vote themselves an additional £10,000 per annum communications allowance. My colleague Julie Kirkbride MP told the Commons when this was first given an airing in November, that this is an exercise in “save our seats” for Labour MPs. Chris Chope MP called it a “propaganda allowance,” and it is being fiercely opposed by us on the Conservative side. Constituency battles are already skewed in favour of incumbents in this country. Not as badly as, say, in the United States, but nevertheless challenging candidates of all parties reading this will know of their despair at seeing taxpayer-funded House of Commons letters to constituents from MPs and other forms of taxpayer-funded promotions which appear almost identical to publications direct from the political parties. Readers will be aware of the recent scandals of MPs’ postage expenses, even before this new £10,000 allowance is introduced. At present, average postage claims are about £4,000, but some Labour MPs claim far more. Hendon Labour MP Andrew Dismore claimed £25,146 last year, equal to sending 83,000 letters, or 612 for every day Parliament sat last year. The new allowance, I am told by House of Commons staff, will include “proactive communications with constituents and others, newsletters, leaflets, annual reports and the postage for them. Royal Mail and paid leafletters would all be legitimate.” I expect that the challengers in marginal constituencies will be horrified. Taxpayers will develop an even dimmer view of how politicians spend their money and the overall expense bill of the House of Commons will go up by as much as £6,500,000 each year. If the next election is three years away, then each MP will have an additional £30,000 to spend. To put it in perspective, this is a similar amount of money over the long pre-election period to that provided to a select group of constituencies by Lord Ashcroft in the period 2003-2005. The ability of MPs to send out mass communications via the Royal Mail is a huge advantage to Labour MPs, who these days struggle to find activists on the street to do the deliveries for free.